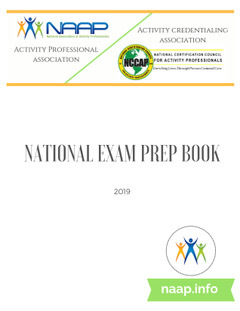 View cart “NAAP EXAM – REVIEW & STUDY GUIDE BOOK” has been added to your cart. The NAAP Policy & Procedure manual was developed in 2013 and is filled with specific policies & procedures that meet federal guidelines in meeting the management needs of the activity department. The NAAP Policy & Procedure manual was developed in 2013 and updated to reflect new the regulations in 2018. It is filled with specific policies & procedures that meet federal guidelines in meeting the management needs of the activity department. Policies include how to run specific activity groups, volunteer management, and pet therapy.